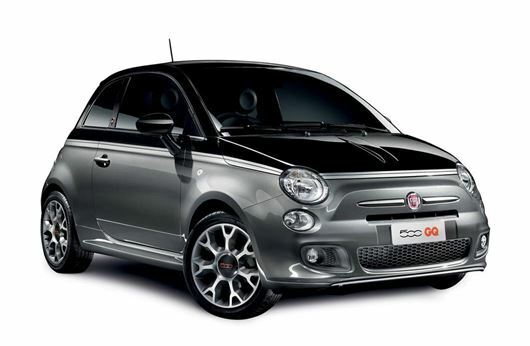 Fiat has launched a new GQ special edition of its popular 500 in a tie up with the men's magazine. Fiat says it is aimed at a predominately male audience which is hardly surprising given the GQ collaboration but doesn't exactly tie in with the popularity of the 500 with female buyers. However in a delightfully pretentious marketing phrase, the brand says it will appeal those who love the 'metropolitan lifestyle and are fans of sophisticated aesthetics and uncompromising style.' Perhaps this explains the two-tone grey and black paintwork, 16-inch alloys and some lovely looking GQ badges in the pillars. The special edition is based on the 500S and comes with either a 1.2-litre petrol with 69PS, a 0.9 TwinAir with 85PS or a big manly 1.3 MultiJet diesel with 95PS. It's available as a standard 500 hatch or the more masculine 500C convertible. Inside it gets a sports leather steering wheel. Bluetooth, black leather seats with orange stitching and an orange 500 logo on the dashboard. There are also brushed aluminium pedals and a leather gear knob. Prices start at just £13,110 for the 1.2 and £15,930 for the 1.2 500C convertible version, that's £1700 and £1520 respectively more than the 500S versions.